Type locality is ‘Ganges River, below Calcutta, India’, but this species is very widely-distributed throughout much of the Indo-Pacific with records existing from coastal waters of eastern and southern Africa, Madagascar, Mauritius, the Mascarene Islands, the Seychelles, India, Sri Lanka, Bangladesh, Myanmar, Thailand, Vietnam, Cambodia, China, Macau, Hong Kong, Taiwan, Japan, Singapore, Malaysia, Brunei Darussalam, Indonesia, the Phillipines, Palau, Papau New Guinea, Australia, New Caledonia, and Fiji. Generally inhabits coastal, brackish environments such as estuaries, lagoons, and mangroves but also known to penetrate tidal freshwater rivers to an extent. It tends to be associated with submerged vegetation or woody structures such as mangrove roots and is mostly demersal with substrates tending to be composed of mud or sand. A single specimen can be maintained in an aquarium with base dimensions of 75 ∗ 30 cm or equivalent but larger quarters would be required by a group or if you wish to keep it in a community. Best-maintained in brackish water although the precise specific gravity is unimportant provided it does not exceed that of seawater (1.025). Try to find out the salinity of the water in the shop before purchase and aim for something similar initially. It can apparently adapt to both full marine and freshwater conditions but we suspect that long-term maintenance in either may affect its lifespan and overall health. Décor is largely down to personal taste but be sure to provide plenty of structure in the form of driftwood roots and branches, rocks, plant pots, etc., and ensure that lighting is not too bright. A gravel substrate can be used but some pieces may be inadvertently ingested by the fish when feeding so sand is perhaps a better choice. The majority of aquatic plants available in the aquarium hobby will fail to survive under such conditions but plastic alternatives can of course be used, while dried leaf litter can also be added if you wish. 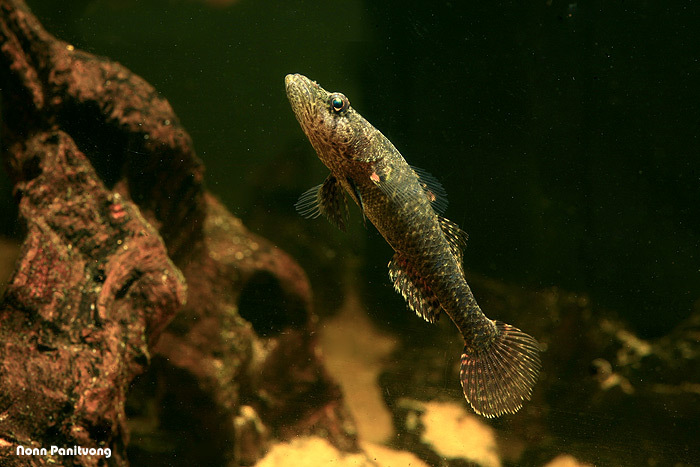 This species is an ambush predator feeing mostly on smaller fishes, worms, and crustaceans in nature. In the aquarium it readily accept prepared alternatives such as prawn/shrimp, stripes of mussel or squid, and live or frozen chironomid larvae, Artemia, Mysis, etc. Like the vast majority of predatory fishes this species should not be fed mammalian/avian meat such as beef heart or chicken. Some of the lipids contained in these cannot be properly metabolised by the fish and can cause excess fat deposits and even organ degeneration. Territorial and may react aggressively towards related or similarly-shaped species, while smaller fishes and invertebrates will be preyed upon. The most suitable tankmates are non-territorial brackish species which grow large enough to avoid predation such as members of Monodactylus, Toxotes, larger Poecilia, etc. It’s not sociable with conspecifics and in general should be kept as a single specimen. Not thought to have occurred in aquaria. B. butis is the most commonly-traded member of the genus and is known by a number of vernacular names with other English examples including ‘crocodile fish’, ‘crimson-tipped flathead gudgeon’, ‘crimson-tipped flathead-sleeper’, ‘crimson-tipped gudgeon’, ‘duckbill sleeper’, ‘flat-headed gudgeon’, ‘pointed-head gudgeon’, ‘bony-headed gudgeon’, and ‘upside-down sleeper’. According to Rainboth (1996) it’s diagnosable via the following combination: teeth in outer row enlarged; upper jaw extending to anterior portion of eye; 20-25 predorsal scales; body shallow, its depth fitting 5-6 times in its standard length; interorbital space and cheek below eye scaled. Butis spp. are largely nocturnal ambush predators with cryptic patterning to help them blend in with their surroundings. They can also lighten and darken their body colouration to an extent, have a habit of aligning themselves with solid surfaces whether horizontal, vertical, or inverted, and often swim in an upside-down position. The genus is usually included in the family Eleotridae of which members are often referred to collectively as ‘sleepers’, ‘gudgeons’ or ‘bullies’. 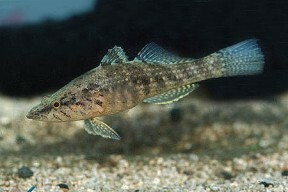 The grouping is included in the suborder Gobioidei and species can be separated from the related families Gobiidae and Gobionellidae (commonly referred to as ‘gobies’) by lacking fused pelvic fins, never possessing an inferior mouth, possessing separate spinous and rayed dorsal fins, and presence of six (rather than five) branchiostegal rays, the latter feature being shared with other gobioid families Rhyacichthyidae and Odontobutidae. The reproductive cycle of most eleotrids features a marine stage although the majority live in freshwater as adults and some are entirely restricted to such habitats. They tend to be bulkier and possess heavier scaling on the body than most other gobioids. The family is traditionally split into two nominal subfamilies with Butis included within the Butinae alongside the genera Bostrychus, Incara, Kribia, Milyeringa (sometimes included in the family Odontobutidae), Ophiocara, Oxyeleotris, Prionobutis, and Typhleotris, and all other eleotrids contained in the Eleotrinae assemblage. Neither subfamily is considered monophyletic, however, and a series of morphological and molecular phylogenetic studies have been carried out, though thus far no definitive conclusions have been reached. This lack of monophyly has led to the two subfamiles being raised to full family level as Eleotridae and Butidae, respectively, with Thacker (2009) demonstrating that Butidae is sister to a clade containing Gobiidae and Gobionellidae, with Eleotridae sister to that clade of three families based on the results of her molecular analysis of the suborder Gobioidei. This hypothesis was rejected by Agorreta and Rüber (2012), however, who concluded that this molecular phylogenetic hypothesis is ‘unstable’ and fails to definitively rule out a number of alternative theories, thus it cannot be used as a basis for changes in classification. Eleotridae is certainly not monophyletic though since Eleotrinae does not share a most recent common ancestor with Butinae, and it seems clear that additional study is required to resolve the higher-level taxonomy of the grouping. At any rate Butis spp. can be separated from other eleotrids by the following combination of characters: scales on body ctenoid, at least posteriorly; scales moderate to large, typically fewer than 100 in the lateral series; preopercle without spine; predorsal scales in fewer than 30 rows; bony irregular ridge or row of spiny serrations above eye and on top of snout (spines may be indistinct); lower jaw distinctly anteriormost, chin protruding; head without fleshy knobs or barbels on chin; distinct black spot on pectoral-fin base or on bases of pectoral-fin rays; marine to estuarine life history. A standardized reanalysis of molecular phylogenetic hypotheses of Gobioidei. Field guide to the freshwater fishes of Australia. FAO species identification field guide for fishery purposes. Systematics of Butidae and Eleotridae. Molecular phylogeny of basal gobioid fishes: Rhyacichthyidae, Odontobutidae, Xenisthmidae, Eleotridae (Teleostei: Perciformes: Gobioidei).